… And the new champion is D-o-g-b-o-e !!!!!!!!!!! Twenty-three year-old Isaac Dogboe has become the youngest world champion in Ghana’s rich boxing history! Dogboe stopped Jessie Magdaleno in the 11th round to win the WBO super bantamweight championship in Philadelphia, Saturday. The young Ghanaian, (19-0, 13 KO), started rough in this one; Magdaleno (25-1, 18 KO) dropped the challenger in the opening round but Dogboe, who had never been down before, shook it off and came on strong as the fight went forward. In the fifth round, it was Magdaleno’s turn to taste the canvas for the first time in his career, as he was dropped by a monster right hand and badly hurt. To Magdaleno’s credit, he got up and fought on, even calling Dogboe on, repeatedly. But the hubris wasn’t enough, as Dogboe plugged away with effective body work and hard right hands to the head, keeping Magdaleno cornered or on the ropes far more than Magdaleno wanted. It’s worth noting that Magdaleno hadn’t fought in a year, but anyone would probably have wilted under the pressure Dogboe put on here, as it was truly effective aggression. Magdaleno got himself steadied as the rounds went on, but was still mostly losing them. In the 11th round, Dogboe dropped him again, and Magdaleno complained that he was hit low. The fight went on, with Dogboe rushing Magdaleno in the corner, unloading shots until Magdaleno went down a third time, forcing the referee to step in and stop the fight. The two fighters, who talked plenty leading up to the bout, especially Dogboe, embraced after the bout. 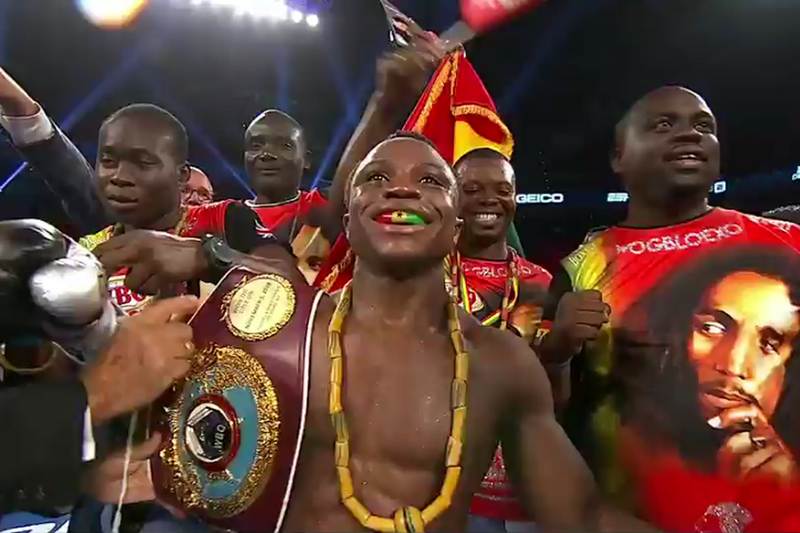 As for Dogboe, it’s obviously a dream come true for the young fighter, and he jumps up into the very top of the ranks at 122 pounds with this win. In the co-feature, top super middleweight contender Jesse Hart stopped Demond Nicholson in the seventh round of an eventful and entertaining bout, a little sloppy, but both guys throwing with intent throughout. The official time of stoppage was 2:26 of the seventh round. Hart (24-1, 20 KO) started aggressively but was rocked at the end of the first round by Nicholson (18-3-1, 17 KO), who was ruled down twice in the third round. One looked like a mistake by the referee, but the second was a knockdown. Hart dropped Nicholson again in the seventh, and then we got a strange scene with Nicholson arguing with the referee from his knees, and the referee stopping his count before 10. Nicholson was down longer than a 10 count, but the referee let him get up, then stopped the fight via TKO. There was more arguing, and some words exchanged between Hart and Nicholson, too. But in the end, the winner was Jesse Hart, and he was clearly the better man on this night, however weird the finish might have been. The opener was an all-Philly heavyweight bout between Bryant Jennings and Joey Dawejko, with North Philly’s Jennings improving to 23-2 (13 KO) with a 10-round unanimous decision victory. Jennings won on scores of 98-92 across the board, with BLH scoring it just slightly closer at 97-93. Dawejko falls to 19-5-4 (11 KO) with the loss in what was just the second time he’s ever been scheduled for 10 rounds, going the distance both times. Off television, featherweight prospect Shakur Stevenson went to 6-0 (3 KO) with a second round stoppage of Roxberg Patrick Riley (12-1, 6 KO).